An implantable eye prosthesis has been proposed for people with eyes and optic nerves damaged by illness or head trauma. 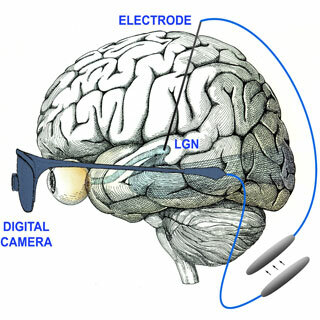 The basic idea is that signals from a camera worn in a pair of glasses will be transmitted to an implanted array placed in the part of the brain responsible for sight. Small digital camera mounted in lens; the signal is sent from an external processor to an implanted stimulator. John Pezaris, the Boston neurosurgeon championing this idea, has modest goals at the outset. He says that "a remarkable amount of information can be conveyed in a relatively small number of pixels." Much of Pezaris's work is based on "best guesses," he acknowledges. He and former Harvard Medical School colleague Clay Reid first described their research into visual prostheses in a paper published last May in the Proceedings of the National Academy of Sciences USA. The paper described experiments performed on two adult macaques with electrode brain implants to determine whether the primates would react when electric stimulation was applied. The researchers were able to show that microstimulation in certain areas of the brain does create a percept that the brain interprets as optical input, or something that can be "seen." The researchers were unable, however, to determine some of the details of the impression, such as its exact size or shape, although they knew that the percepts were, "like points of light, or single pixels," he says. How long had it been - four, five, six days? - since the robo-surgeon had worked him over? He raised his head. The room was dark. The thing which protruded from his left eyesocket hummed. Finally, it grew silent and he had vision on that side. Story from Scientific American via KurzweilAI.